Bitcoin is heading towards $10,000 again, despite comments from the US billionaire Charles Munger who described the digital currency as “noxious poison”. Investors like Charlie Munger have tremendous expertise in picking specific kind of stocks, in particular companies which seem relatively “cheap”. This is the cornerstone of what is described as value investing. At the same time, they are not really interested in macroeconomics, technology, currencies and so on. On some level, it is easy to label something which has appreciated markedly a bubble. Our point here is not to disregard the quite worrying magnitude of Bitcoin appreciation to $20,000 and the recent slide. We do believe, however, that you can’t have a complete picture not considering the details of the currency. And so, we would like to give you just a bit of flavor why Bitcoin is not necessarily done. First of all, the fact that something has gone up a lot doesn’t mean it can’t go further still. Look at Amazon. We heard the story that Amazon was overvalued, “a bubble” and so on back in 2014 when the stock was close to $300. Now, it’s close to $1,500. Take Facebook, Google and other major technology companies. What was dubbed “overvalued” years ago is now a lot higher. A lot. The other example is Bitcoin itself. When the currency went down in early 2014 it was frequently described as the end of the bubble. Fast forward a couple of years and we had Bitcoin at $20,000. So much for the burst of the previous bubble. Now, we care about providing you with the details, so we have to stress that the move to $20,000 indeed looked worrying. Our point here is that you can’t slap terms like “noxious poison” on Bitcoin without considering the current emotions and trends in the market. Bitcoin is on the move up. Or is it? The situation is still as tense as a hypothetical already profitable trade can be. The question remains whether the profits on the position will grow from here or changes to the outlook have indeed transpired. Certainly, one part of the story is that the move up has been unfolding on waning volume. This is an indication. While a move down on low volume wouldn’t necessarily have bullish indication, a move up on decreasing volume might have such implications. In the last 10 days, we have seen a move up and the indications remain in place. The move so far hasn’t been on particularly convincing volume which is a bearish indication. Also, the currency is still below the psychological level of $10,000. An even more important point is that even if the currency moves above this level, we don’t necessarily have to see an acceleration of the rebound. This might be better visible on the long-term chart. On the long-term Bitfinex chart, we see that the current upswing is relatively limited. If we see a more pronounced move to the upside, we might reconsider. At the same time, we don’t see massive changes in the risk-reward at the moment of writing. The 78.6% retracement, which we previously described as “not that important” has been breached but the 61.8% retracement hasn’t been broken. This means that the move up might be a lot less important than it is cracked up to be. This brings us to the apparent thing visible on the above chart. Compared with previous moves, the current rebound is relatively small. Add to that the fact that some of even the less important retracements haven’t been broken, the volume is small and potentially declining, and the not-so-oversold status of the RSI and we have a bearish implications on our hands. The mere fact that we saw Bitcoin reverse on strong volume is not necessarily an indication that Bitcoin is bound to move higher. Think about that for a second. 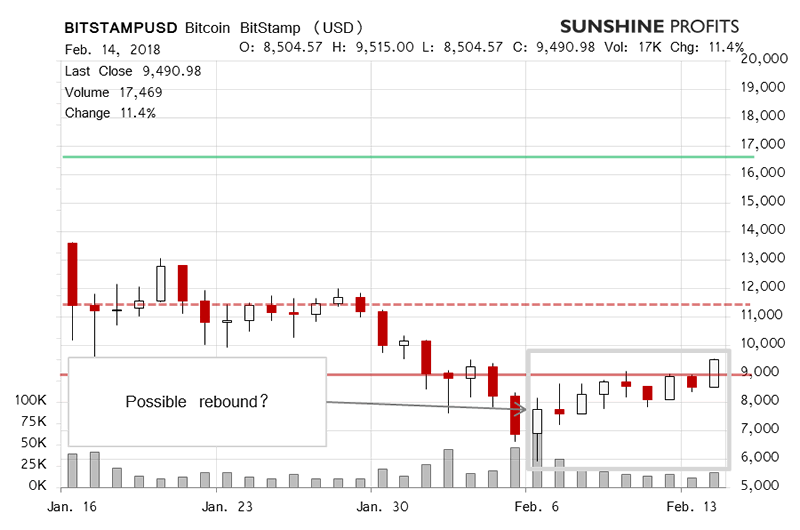 The previous rebound on strong volume was around January 17, 2018. What happened then? Bitcoin went up for a while but went down relatively quickly and continued the decline. So, the fact that we’re seeing a rebound now is not surprising as it is in line with what we saw during the last rebound. Why don’t we see the short-term situation as bullish? The main reason is that the move down might occur quite rapidly and it might not be possible to re-enter hypothetical shorts at better prices. Together with the suggestion that the scope of the move up is potentially limited, this might indicate that the situation is bearish from a trading perspective. The 78.6% level, which is not that important, is now broken but the 61.8% one isn’t and the much more important level 38.2% is very far. This means that, in our opinion, the current trend down remains in place. 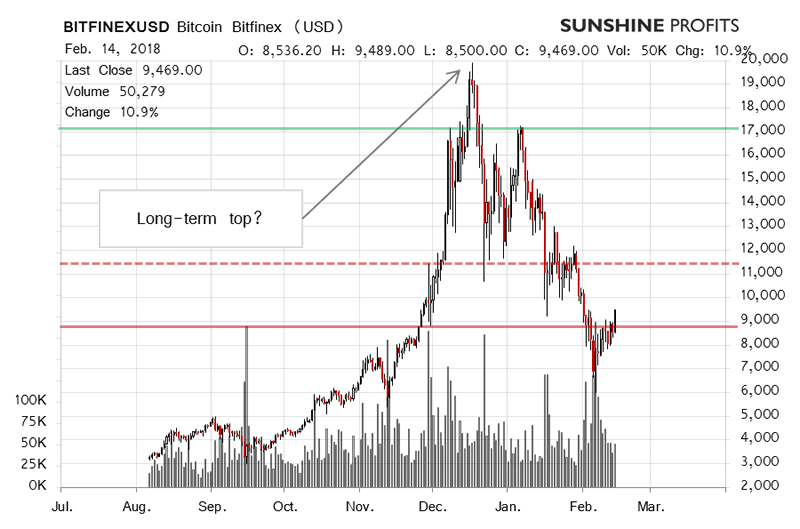 An earlier warning level around $12,000 based on the recent tops is also quite far away. So, while the current rebound is to the upside and it might look worrying, we don’t think it really is as there are no market indications validating the rebound. No asset goes down in a straight line, which means that no matter how strong a decline is, you are bound to see corrective upswings along the way. Actually, it might be the case that the current rebound is setting up a situation in which Bitcoin is on a knife edge and the move down might accelerate shortly. The outlook remains bearish, in our view.